We are a family business with a long tradition in olive oil. Our company Andania gaia - based in Andania Messinias, has been active since 1990 with the establishment of a traditional mill. After gradual phases of modernization, the mill was perfected, under the Community Development Programme in 2011. Production process starts from primary production of the product in the olive grove and reaches final packaging of olive oil in our modern business facilities. 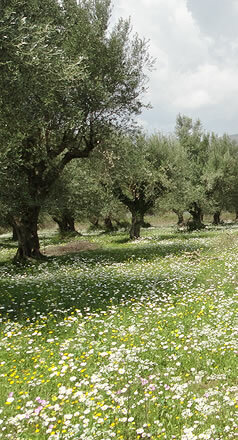 We select the best fruit from our olive groves and turn them into oil in our own oil mill through cold pressing. We produce extra virgin olive oil, extra virgin organic olive oil, P.D.O Kalamata olive oil and our limited edition First Harvest olive oil, using traditional techniques in combination with love, passion and knowledge of the oil industry. The oil production process is done under very tight controlled conditions in accordance with EU regulations. Afterwards, oil is stored in stainless steel tanks for the sole purpose of ensuring constant quality, unique aroma and excellent taste with all the rich ingredients of the fruit. This way, we can offer you an olive oil of excellent quality and flavor while maintaining all the beneficial components of olives. Our company is certified with HACCP (Food Safety Management System), ISO (Quality Management System), ΔΗΩ (Organisation for Control and Certification of Organic Products).